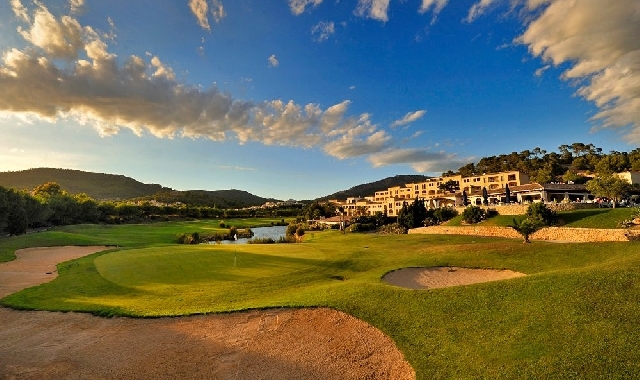 Golf de Andratx is situated in the south western corner of Mallorca, the largest of the Balearic islands. The course winds its way through some breathtaking landscape, adorned with age old olive groves, almond trees and ancient Mallorca stone walls, all features of the course. The 18 hole championship course is already well known as one of the most difficult and challenging in the Mediterranean. Hole 6, 609 meters from the championship tee, is the longest hole in Spain and one all golfers look forward to playing. It winds uphill, through trees and water hazards, and is fraught with danger. The tee shot from hole 8, shortly afterwards, offers a spectacular view of the bay in Camp de Mar and the hills around it. Adding to the complete golfing experience at the club is the Italian styled "Campino" restaurant in the clubhouse, the first class Pro Shop with all the latest golfing fashion and the Golf Academy with its PGA Professionals and the most up to date teaching tools. Serveringen mellan 8:an och 9 :an var helt suverän. Det bästa som jag upplevt på en golfbana. 5 +. Trevlig omgivning men usel finish på banan, särskilt gäller detta greenerna som var under all kritik. Tråkigt för en annars fin atmosfär. Beautifull holes with lots of high situated teeboxes. Perfectly situated in nature. Before hole 9 you can have a drink/coffee/something to eat. Fantastisk bana i toppenskick! Golfbil rekommenderas starkt! Meget smuk, men vanskelig bane med smalle og kuperede fairplays. Kul ban. Bra variation. Bra skick. Långt mellan hålen. Golfbil är ett måste. Mycket vacker bana. Bra restaurang. Golfbil nödvändigt, långa avstånd mellan hålen. Lang og tung bane å gå! Veldig mye bratte bakker, har du ökonomi lei bil! Veldig mange plastikk utslags tee, dårlige greener. Sehr schöner, aber auch anspruchsvoller Golfplatz. Gute Atmosphäre und zuvorkommendes Personal. Green Fee is to expensive. The golf course isn‘t in a good condition (Fairway and Green). Om formiddagen ved vores ankomst var service og stemning i top, både i shoppen og i restaurent / cafeen. Om eftermiddagen oplevede vi en mandlig tjener, der ikke burde være tjener. Han var hoven, negativ og ydede ikke nogen god service. Måste vara vackraste banan på Mallorca. Men krävande. Rekommenderas. Spektakulär bana med vackra vyer. Mycket bra och rolig bana. Den kräver dock golfbil eftersom det är mycket långt mellan vissa håll - och riktigt kuperat. Trevligt bemötande men banan är inte möjlig att gå, buggy borde ingå i greenfee, buggy bara på vägar gjorde spelet krångligt och jobbigt.